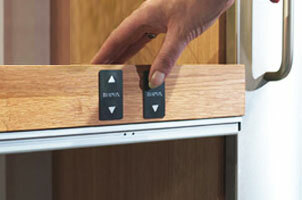 Why not let us create a more accessible bedroom to make life easier for you. 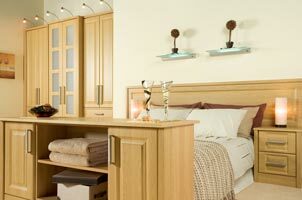 We are able to design, manufacture and install bedroom furniture to suit the needs of wheelchair users. We can tailor our fitted bedroom ranges to suit the specific individual bedroom furniture and storage requirements of all our customers. We can supply custom height wardrobes with accessible hanging heights, and units with tailored shelving and drawer combinations. Bedroom installation is carried out by our skilled bedroom fitters, using the latest bedroom equipment tools. Our bedroom wardrobes and contemporary furniture can add much more needed bedroom storage, along with bedside tables, bedside cabinets, chests of drawers and dressing tables. We don't think you should have to compromise on style when you create your accessible bedroom. Our bespoke bedroom wardrobes and furniture are available in 100 different colours and styles and we can provide matching hand rails and aids to complete the look and accessibility of your bedroom. All bedroom design is done by our award winning bedroom planner, Ashley Lambie. 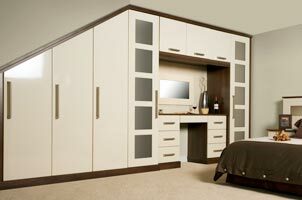 So, for a bedroom design to suit your specific needs just give us a call. Just a small selection of bedrooms that we can offer. So for accessible bedrooms in Scotland, just give us a call.